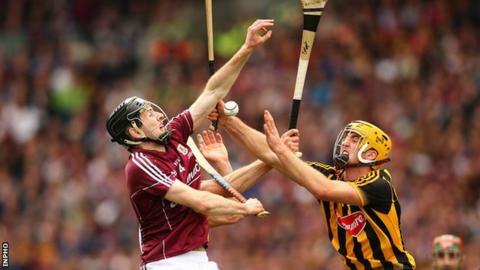 All-Ireland champions Kilkenny and beaten finalists Galway both have 12 players nominated for this year's Hurling Allstars team. Shane Prendergast, Walter Walsh and Colin Fennelly are the only members of the Kilkenny All-Ireland winning line-up to miss out. John Hanbury, Aidan Harte and Cyril Donnellan are the Galway's final starters not to be nominated. Unsurprisingly, there are no nominations from Ulster counties. Antrim endured a dismal 2015 as they were relegated to Division 2 of the Hurling League and then suffered the indignity of dropping down to the Christy Ring Cup for next season. League champions Waterford have 11 nominations with Munster champions Tipperary handed seven. The other players nominated in the 45 are Clare's Tony Kelly, Cork's Seamus Harnedy and Dublin's Mark Schutte. Kilkenny's TJ Reid and Richie Hogan are nominated for hurler of the year with Tipperary's Séamus Callanan. Galway's Jason Flynn duo Cathal Mannion and Waterford's Tadhg de Burca are the contenders for young player of the year. Daithi Burke (Galway), Cillian Buckley (Kilkenny), Joey Holden (Kilkenny), Paul Murphy (Kilkenny), Pádraic Walsh (Kilkenny), Johnny Coen (Galway), IarlaTannion (Galway), Pádraig Mannion (Galway), Kieran Joyce (Kilkenny), Pádraic Maher (Tipperary), Cathal Barrett (Tipperary), James Barry (Tipperary), Noel Connors (Waterford), Tadhg de Búrca (Waterford), Shane Fives (Waterford), Austin Gleeson (Waterford), Barry Coughlan (Waterford), Philip Mahony (Waterford). Tony Kelly (Clare), Séamus Harnedy (Cork), Mark Schutte (Dublin), Cathal Mannion (Galway), Jason Flynn (Galway), Jonathan Glynn (Galway), Joe Canning (Galway), Conor Whelan (Galway), Ger Aylward (Kilkenny), TJ Reid (Kilkenny), Eoin Larkin (Kilkenny), Richie Hogan (Kilkenny), Brendan Maher (Tipperary), John O'Dwyer (Tipperary), Séamus Callanan (Tipperary), Colin Dunford (Waterford), Maurice Shanahan (Waterford), Michael Walsh (Waterford).